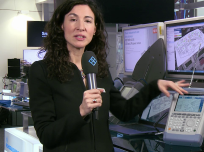 Rohde & Schwarz presented the new indoor mapping option for network operators at the GSMA Mobile World Congress 2015 in Barcelona. To measure indoor coverage where no GPS signal is available, indoor maps are imported into the R&S®FSH handheld spectrum analyzer. The actual measurement position can easily be marked on the map.